Heyyyy- Christmas is so close and if you haven't started shopping or even started thinking about shopping- get movin', times wastin'! 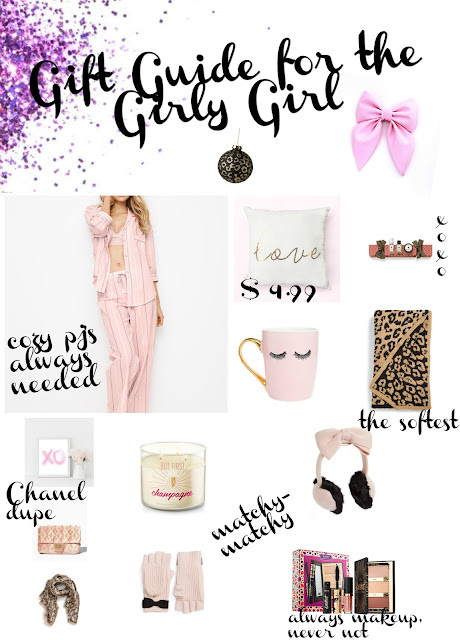 Here are some girly-girl gift ideas for the diva in your life! PJ's- all girls need/want cozy pj's that are also adorable, ditch the ratty t-shirt and get luxe! CANDLES- an obvy choice- it has to be a fact: all women love candles?! Makeup- Does she love makeup but you have no clue what to buy? Buy a GIFT SET with a little bit o' this & that, can't go wrong!